Thank you for your help renting the property! Sea Watch 1314 is a little jewel! Beautifully decorated, thoughtfully equipped, and extremely comfortable throughout. The view cannot be beat, and the building is very attractive. i asked for early check in - elaine was prompt with a reply and was able to accomodate us. the key code made it so easy to check in without making an extra stop. Our family loves CI - we've stayed at a variety of places - motels, cottages, and home rentals. This property exceeded our expectations - there was plenty of room, it was well-maintained, very clean, and we all enjoyed it immensely! They were very helpful, friendly, and knowledgeable. We loved our stay at Teal Point. The house is beautiful and well maintained. The views are breathtaking. Elaine Stitcher always goes out of her way to make sure that we are happy and comfortable. She went over and above for us during the threat of Hurricane Florence. Can't wait to return. Only issue we noted was that the dishwasher was stuck in heavy duty mode and could not be changed. Heavy duty runs for 2.5 hours. Elaine always responded quickly and was readily available to answer any of my questions even after we had arrived. She was always very helpful every step of the way! Thanks so much for allowing us to stay in your home! 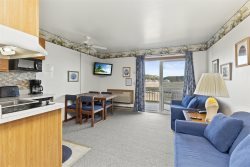 Albion is close to everything,(food, shopping, activities) and not too far from the beach. The house itself was simply perfect- the pictures on line dont do it justice! Beautifully decorated, roomy and comfortable, as well as spotless! The screened in porch was such a plus. We could not have asked for a more perfect place to stay! We hope to be able to return next year. We had an amazing week - my kids said "the best vacation ever"! Thank you so much for making check in/check out easy! Elaine has been amazing throughout the whole process!! Loved it. Already looking at your vacation rentals for 4 in OCMD for next summer!!! Something on or close to the beach as we love to enjoy the waves!! Look forward to renting other properties in the future!! Elaine was very nice and responded to us quickly. The house was great! We would like to stay again but can't determine a date this far in advance. It was clean, roomy, great location, kitchen had everything we needed even if some pans were a bit weathered. We loved being directly on the water. The kids went fishing and crabing each day, and we could safely watch them from inside in the air conditioning. I was very impressed with the guest house. Loved house. Grandchildren got to see dolphin swimming by. Everything we needed was provided. Another wonderful trip booked with Elaine, this was our third house rental and we had no problems and we will definitely rent again!